My neighbor’s wildflowers are in full bloom. 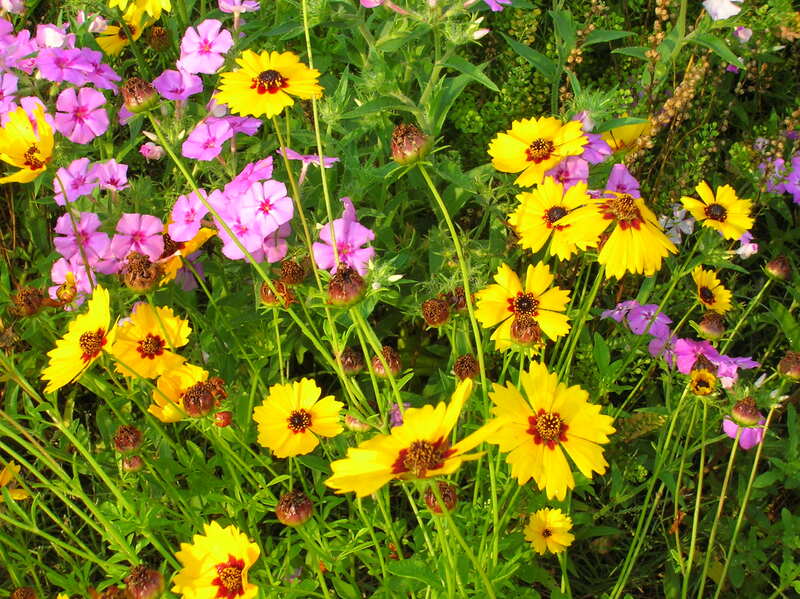 Each spring his yard bursts into glorious bloom, yellow coreopsis and pink phlox jostle each other for space. The effect is dazzling and carefree. But the reality of the field of flowers is another thing. It took several years to get the display to its current state of excellence. Wildflowers are possibly one of the easiest of flowers to grow, but they do have a few basic needs. A field of wildflowers takes more than just sprinkling out a few seeds. Timing of planting is important. Your future wildflower garden should get full sunshine, and if you are devoting a portion of your lawn to wildflowers as my neighbor has done, the wildflower plants in the area will need to be allowed to grow without being mowed or disturbed for about five months — January through May. • For best results, do not till or disturb the soil. • Thin turf cover: Broadcast the wildflower seed over the area then rake or drag the area to obtain seed-to-soil contact. • Average turf cover: Scalp the turf to one inch, remove the clippings, then broadcast the seed over the area and replace the clippings evenly as a mulch. A mechanized seed drill can be used without removing the clippings. 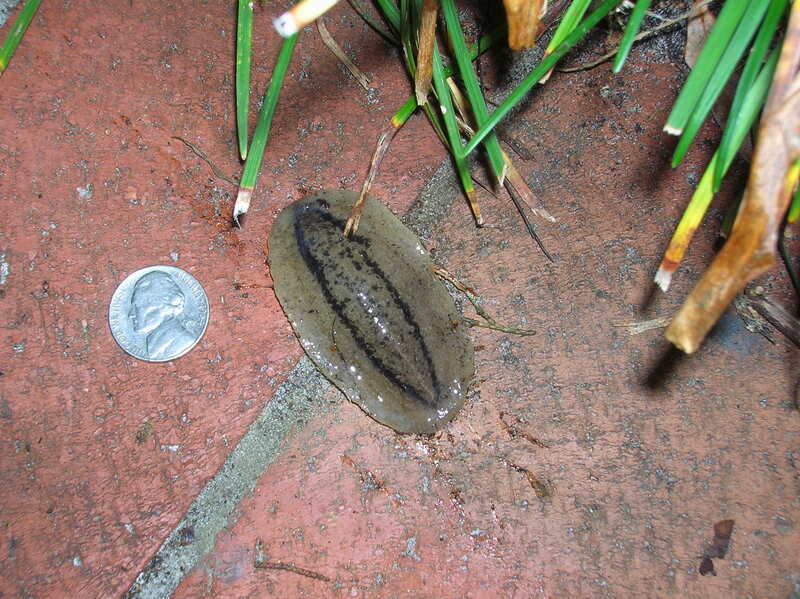 • Heavy turf cover: Herbicide and let the area sit for one month. Scalp to one inch. 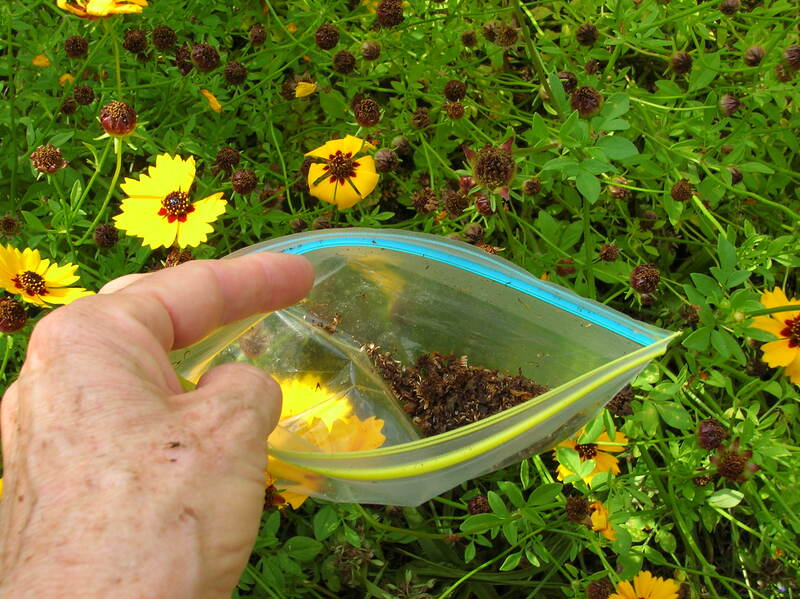 Then broadcast the wildflower seed over the area then rake or drag the area to obtain seed-to-soil contact. NOTE: The establishment of wildflowers is not recommended for areas of heavy turf and areas of excessive weed infestation. The use of a mechanized seed drill designed for planting wildflowers produces the best results. The cooperative’s growers report that they produce seed of native wildflowers that are adapted to your area’s conditions in meadows, roadsides, natural areas and other non-cultivated sites. I finally have it! Got my purple crinum (Crinum procerum var. splendens (Queen Emma’s Purple Crinum). The old girl is settling in nicely. It was quite a search as this hardy perennial isn’t always easy to locate. Once located, be prepared to splurge. Rarely is it seen at those big-box store nurseries. But, believe me, the search (and cost) are well worth all the trouble. Found mine at Southern Horticulture in St. Augustine, a great source for plants and ideas. Though I didn’t purchase the larger pot size, the one I selected literally hit the ground running, and has almost doubled in size since it was planted about three weeks ago. (That’s not it that you see to the left. That one is in Fairchild Tropical Gardens in Coral Gables.) It is a stunning plant, one to design a garden around, a true specimen bound to demand attention and admiration. Like all crinums, this one can take just about whatever weather is thrown at it. Drought-tolerant and sun-loving, it will have best foliage color when grown in full sun, though crinums can take a bit of shade. 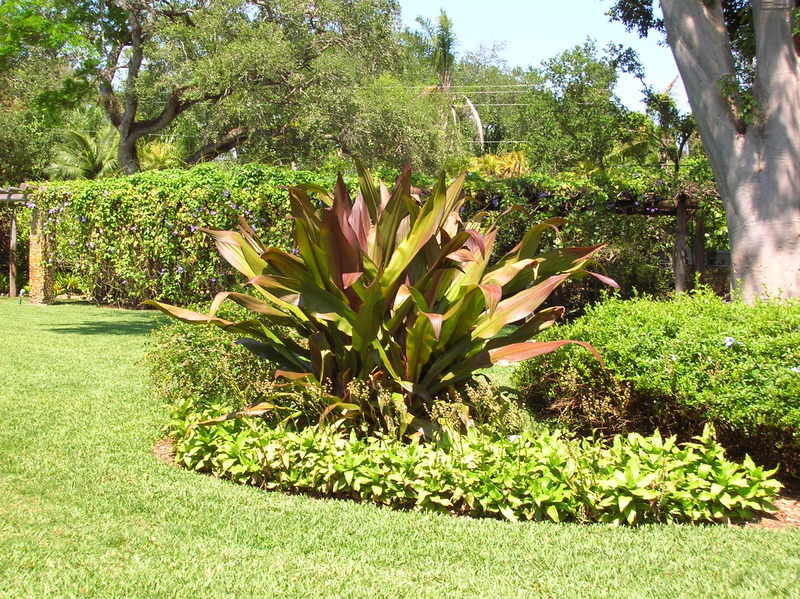 The purple crinum is especially handsome with huge four-foot long leaves, growing in clumps to around six feet in diameter. 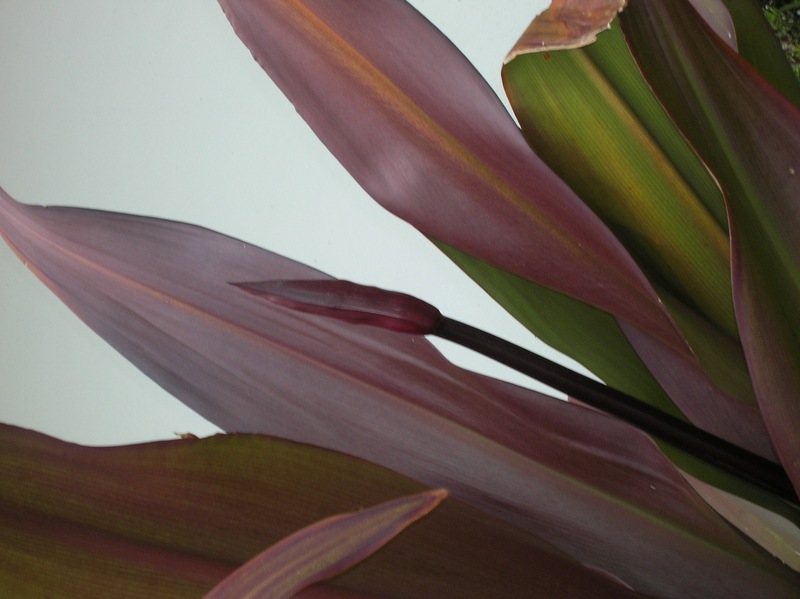 Upright rigid foliage emerges a rich burgundy with undertones of dark green. In late fall the huge clusters of fragrant white flowers tinged with deep burgundy emerge. And like all crinums, the bulbous plant has “contractile” roots that literally winch that sucker down into the ground as it grows. So in other words, don’t expect to easily transplant this or any crinum if you should change your mind about its location. (Might need to consider a stick of dynamite if you do. Just kidding.) It is hardy to 20° F and should be watered regularly until well established. Although this and other crinums are evergreen, expect winter die-back after especially cold weather. 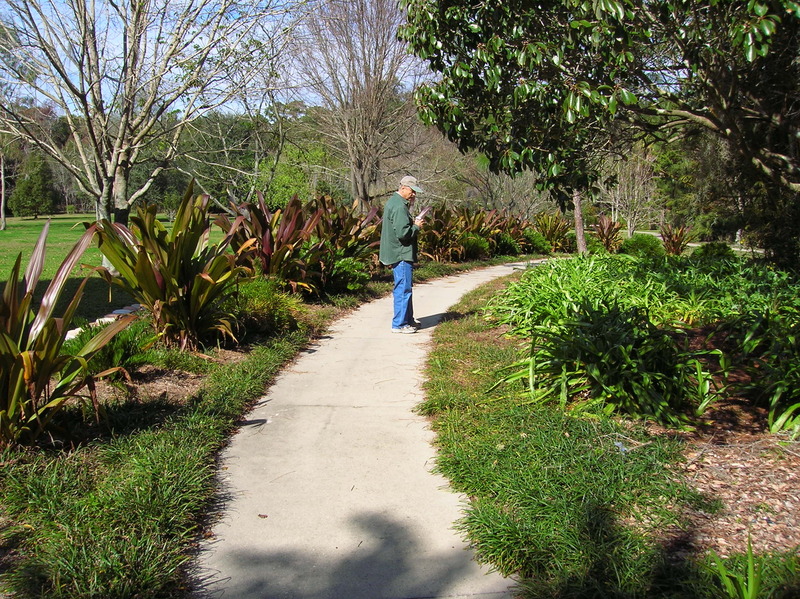 A great place to see criumns, like the purple queen, is Kanapaha Botanical Garden in Gainesville, where there is an extensive crinum garden. Happy hunting for your own purple queen. This handsome little creature, the rosy wolf snail, is one of your best gardening allies because it hunts down and eats slugs that eat your garden plants. 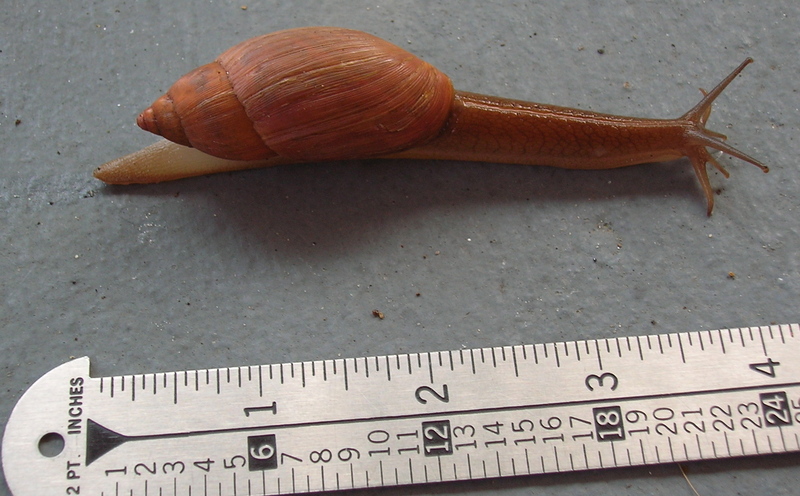 Native to the state, this carnivore snail grows to four inches and longer.